Some time ago Terence came up with an idea to go to the World Cup. We were unable to organise anything for a couple of seasons. But this year our club was in a better position to prepare for the trip. Alongside this, two other people, Daniel and Vlad, decided to join in. Therefore, we decided to make this happen. * The competition registration is made of 2 parts as well. You need to register the team on CMAS web site and pay CMAS fees. As well as that, you need to pay the fees to the hosting National association (Italian in this case). * For both the accommodation and the competition payments you need to email any payment confirmations back to the organisers. The members of our team flew to the different airports near Venice. 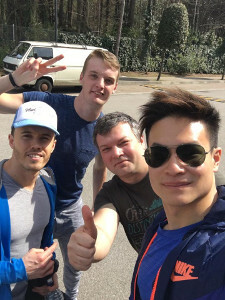 Terence and Daniel arrived to Marco Polo and I collected them first, then we picked up Vlad who came to Treviso. Luckily, the two airports had just a 20 minutes drive apart. Then we drove to Lignano. It took another hour. Lignano appeared to be a holiday resort village. As the season hasn't started yet, it is pretty quiet and peaceful. The day after this silence was violated by the noise and speeds of finswimming. * Official training session. All participants are invited to try the pool. Basically, you are given several hours in the pool to train before the competition. * At the time of the training session the judge certifies the equipment: bi-fins, monofins, snorkels. Therefore all team members need to bring to show their stuff to the judge. I saw someone's monofin was rejected for having a thick rubber patch. Monofins with flat sticky tape patches were approved. * Team registration is done by the team officials. I was waiting in the queue for an hour looking at other coaches who were holding thick folders full of paperwork and was wondering whether or not I was missing anything, as I was holding just a couple of pages with the list of the team. Once entered the registration room it took me about a minute to register and I was told that all is good from our side. I am still wondering what was in those thick folders that other coaches were holding. * Technical meeting. This is very much information meeting where organisers explain what to expect on the poolside during the competition. Only officials need to be present. The competition was nothing unexpected. * Warm up. Due to the high number of people the warm up session is split so women go first and men second. I don't think everyone strictly followed this separation. * Once the competition is started and events are announced, the swimmers participating in the event were expected to proceed to the area where the heats were formed, and then wait for the judges to call them. * In parallel to the heats the winners are invited to the ceremony which runs in the pauses between the events. * One of the key observations for me was that competition is full of children aged 12+. Next time we will try to bring children as well. * It was absolute pleasure to see that some of our results are well in the middle of the table. In the conclusion... We did not win anything. And in fact this was not about the winning this time. This was about participation and understanding all the aspects of the competition. This was about setting a benchmark that we will work against. This was about building up the experience of participation in the international events. This was the very first step made by our club on the international landscape. We have already started planning for the next year participation. I liked this place in Italy but it will be up to the team to decide where to go. 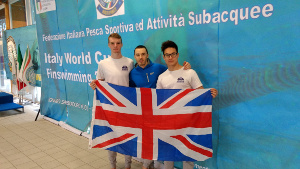 Hopefully for the next time we will be able to bring a bigger team with improved results and score more points so we can proudly tell the teams from other countries that finswimming in the UK is on the rise and we will be competing on par with them in few years time.